David Springer, my gggg-grandfather, is my family's oldest official Springer, since no archival records have been unearthed so far as to who his parents might have been. There's lots of pretty firm circumstantial and DNA evidence, but there is no paper trail directly extending back beyond David. According to one family researcher, "Sometime after their marriage and before 1762, David and Margaret [Oliver] moved to Schenectady, where David is on record as having purchased a cow in 1762. Sometime after the baptism of their son, Daniel, in 1764 and before 1767, David and Margaret moved from Schenectady to the West Manor of Rennselaerswyck, Albany County, New York, where, according to the February 1767 tax list, David Springer's property was rated as One Pound...; this would have been a small dwelling with little or nothing in the way of animals, implements, etc. David Springer was listed in the Militia in the town of Guilderland in 1767. David, Margaret, and their family remained living in the West Manor of Rennselaerswyck up until the time David was killed." I don't know much about David, other than that paragraph and the fact that he was a Loyalist during the Revolutionary War. David was killed as a result of attempting, according to his wife, "to join the army of General Burgoyne at Still-Water accompanied by several other Loyalists, having been overtaken and attacked by the Rebels in superior numbers." Another account, by the author of a local history published in 1845: "On the 13th of August (1777)...Lt. Col. Schermerhorn proceeded to Norman's Kill with a body of Schenectady Militia and 40 Rhode Island troops...in all about 100 men...to root up a tory gathering at that place. The expedition was very successful. David Springer, a noted royalist, was killed, thirteen of his comrades captured, the remainder dispersed, and confidence again restored, where all was doubt and disaffection, without the loss of a single man on the part of the Americans." 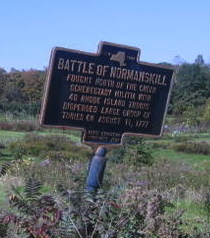 The battle of Normanskill in 1777 left my gggg-grandmother a widow with a large family and her oldest son, Richard, in a jail in Albany for a time. Margaret remained in New York throughout the war. Richard and his younger brother, Daniel, were almost grown by the time their father was killed; they joined the British forces with Butler's Rangers. With the help of her two oldest sons, Margaret immigrated to Canada with most of her younger children in about 1786. In 1793, she petitioned the Crown and a year later was granted 400 acres of land for herself and 200 acres of land for each of the five children (Rachel, Henrietta, Mary, Martha, and Benjamin) who accompanied her to Ontario.